Please also select a seminar to begin the SHRM Talent Acquisition Specialty Credential. Program Overview: Sourcing, engaging and retaining the best talent are top priorities for organizations. Earning the SHRM Talent Acquisition Specialty Credential recognizes the key role that talent acquisition professionals play in today’s challenging business environment by demonstrating your expertise and proficiency as a strategic talent acquisition partner. Intended Audience: Individuals interested in earning a specialty credential that demonstrates knowledge and proficiency of the Talent Acquisition landscape. 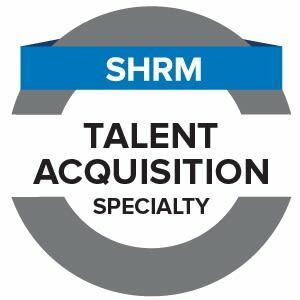 Enrollment in the Talent Acquisition: Creating Your Organization's Strategy Seminar--available in-person and virtually! Attention SHRM-CP or SHRM-SCP credential holders! The 25 PDCs that you earn toward recertification when pursuing your SHRM Talent Acquisition Specialty Credential will auto populate in your SHRM certification profile.